I WILL GET MY REVVVVVVENGE! My first level created with the new editor. I was originally a little confused, but Terry's tutorial helped a lot, and I figured out the rest. 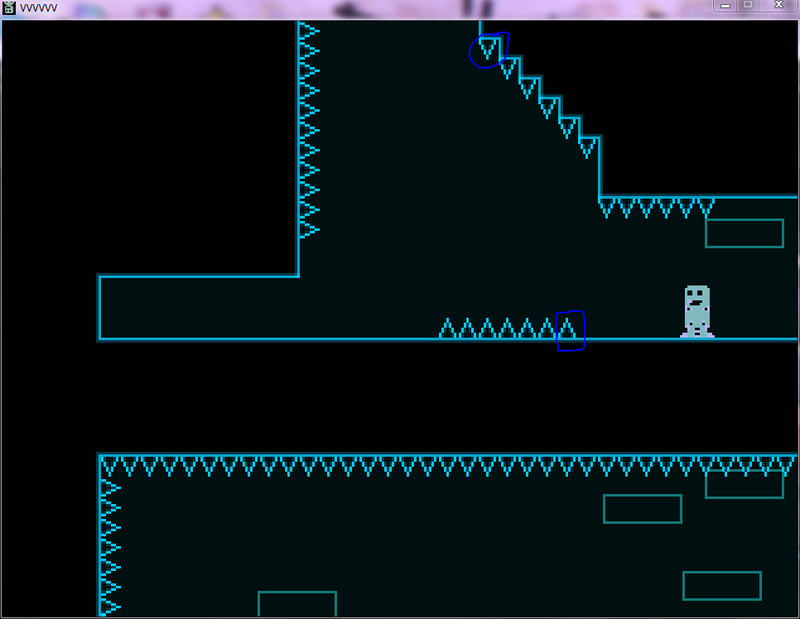 So as a result, I made a level. Nothing fancy; five crewmates have been lost, and it's up to you to save them! It's not super easy, not super hard. I just made it for fun and for people to have fun. That middle path is ridiculously hard to get to; it seems like dumb luck the first 30 times and then you develop a pattern for it. Attached a picture: I really think there should be a save point there. Anyway this level is definitely a good start. It's a little bland with spikes and a couple grav lines but not much else. Not sure how to get the trinket all the way to the West but I enjoyed finding the first one. Bottom line: Good challenging in some parts, bad challenging in others. Needs one or two more save points for fairness' sake. At least make the really hard jumps lead to trinkets, and not to crew members. Definitely charming in the amount of spikes though. I actually didn't find that middle jump that hard, and since I consider myself a terrible platformer (even though it's my favorite genre), I figured it wouldn't be very hard for other people. Meh, maybe I just got lucky. Anyway, as I said, thanks for the feedback! I'll take your advice into account in future levels. Alright, I updated it with a new checkpoint right after the middle jump. Room Design: 10/10 - It's very excellent, no complaints. Scripting: 0/10 - Don't worry, this just means that there is none. Plot: 1/10 - Other than the old, "Rescue crew, collect trinkets," there's no real plot. Kinda boring. Bug-Free Rating: 10/10 - It's not buggy at all - cause there's no scripts! Difficulty: 10/10 - Yep. It is THAT difficult. It made me cry. Overall Rating: 6/10 - I liked the level design, but the difficulty and the lack of scripts/plot kinda ruined it. However, it's still a good level. The circled spike makes it almost impossible to get to the next screen unless you are a half-pixel away from the squared spike. One of the two should be removed. This was a pretty good level! Nice job! Looks like you'd need GODMODE!